The stunning new picture book Miguel's Brave Knight introduces the life of young Miguel de Cervantes and his inspiration for creating one of the greatest works of modern literature, Don Quixote. 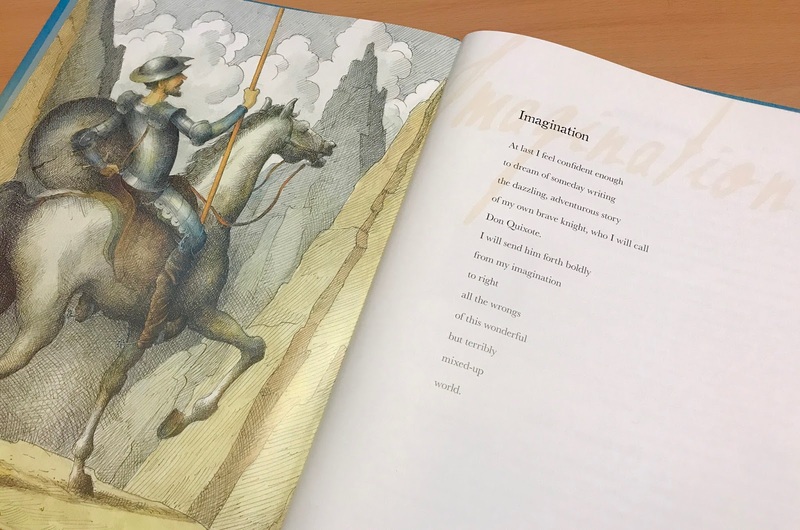 To celebrate and honor Miguel de Cervantes's 470th birthday today, we asked author and Young People's Poet Laureate Margarita Engle and award-winning artist and illustrator Raúl Colón some questions about their celebrated careers and what inspired them to create Miguel's Brave Knight. Q: Margarita, what inspired you to write Miguel’s Brave Knight as a collection of poems? M: The first draft was one simple poem for younger children, similar to Drum Dream Girl. All I wanted to do was honor the comforting power of imagination found in the life and work of Cervantes. Margaret Quinlin, the editor, suggested including more information, to make the book suitable for older children. So I began to experiment, and decided on the format of separate poems for various stages in the childhood and youth of Cervantes. I’m thrilled with the end result. Combined with the incredible artwork of Raúl Colón, I think that in its final form, Miguel’s Brave Knight can be read on many levels, depending on the age of the child or teen. Q: Raúl, what part of Miguel’s Brave Knight did you most respond to? 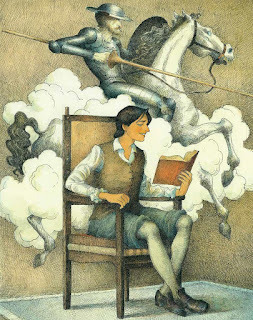 R: The parts of the story I most responded to was whenever young Miguel was imagining Don Quixote’s character. 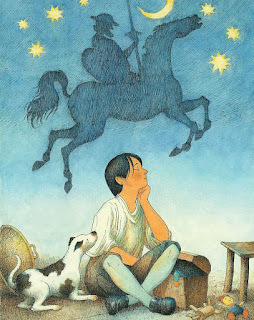 There are two pieces where both Miguel as a boy and Don Quixote appear together. I really enjoyed working on those. Q: Who is Miguel de Cervantes to you? R: Miguel de Cervantes is a hero to me. I had heard about him since I was quite young, but I really came to know him while working on this book. I decided to read his masterpiece Don Quixote in its original language (Spanish) and realized that Cervantes could have been a best-selling contemporary writer today, chock full of wit and stinging satire—maybe even been an HBO limited series writer. Q: Margarita, you were trained as a botanist and agronomist before becoming a writer. What made you make the switch? How do you still use your scientific skills today? M: It was a gradual transition. As a child, I wrote poetry. As an adult, I alternated between poetry, fiction, opinion columns for Hispanic Link News Service, and scientific nonfiction articles for agricultural and landscape magazines. My first feeble efforts to write novels occurred while I was taking a graduate creative writing seminar from Tomás Rivera, the first Latino Chancellor of a University of California campus. Eventually, beginning in 1991 when I was finally able to start returning to Cuba, I decided to focus on fiction. Some of the reviews said my novels were “too poetic,” so a light bulb went off in my mind, and I returned to poetry. Nevertheless, several of my picture books are about scientists, and forests and farms often appear in my verse novels for older children. In some of my verse novels, such as Forest World, The Surrender Tree, Mountain Dog, and Silver People, wilderness actually feels like one of the characters in the story. In my verse memoir, Enchanted Air, I showed how I became both a writer and a scientist, by falling in love with tropical nature during childhood summers spent with relatives in Cuba. Q: As the national Young People’s Poet Laureate, you have the opportunity to inspire a new generation of poets. What poets have inspired you? M: Most of my favorite poets are from Spain and Latin America: José Martí; Rubén Darío; Juan Ramón Jiménez; Antonio Machado; Miguel Hernández; Gabriela Mistral; Octavio Paz; Dulce María Loynaz. I also love nature poets, especially Wendell Berry and Mary Oliver. Q: Raúl, what other illustrators inspire you? R: Well, when I was very young comic book illustrators such as Steve Ditko (Spiderman-Marvel Comics), Joe Kubert (Sgt. Rock- DC Comics), and others really got me started drawing my own characters. A bit later I learned who Norman Rockwell was, and that's when I knew that I might try to do what he did. Finally when I grew up, illustrators like Brad Holland, Mark English, and Matt Mahurin were an inspiration to me. Q: How is your work with children’s illustrating different from your “grown-up” murals and covers? R: Illustrating for children is not necessarily much different than illustrating for adults, except for the mature themes you may create for an adult audience. There is a good deal of fantasy involved in all art. Children tend to remember this much better than adults do. Q: What do you hope readers take away from your art in Miguel’s Brave Knight? R: My wish is that young readers can enhance their own mental images of Miguel's world by reading Margarita's words and looking at the visuals I put together. I hope that at some point in their lives they're inspired to learn more about this Don Quixote character and decide to read Cervantes's novel. Q: How do you hope Miguel’s Brave Knight will be used in the classroom and elsewhere? M: Cervantes is just as famous in Latin America as Shakespeare is in the US. I hope teachers will help children see that they can learn about the whole world, that they are not limited by borders. Stories travel, and they time-travel. Poetry is like a magic carpet that can take us anywhere. With respect to the power of imagination, maybe teachers could talk about the importance of daydreaming in the writing process. Daydreaming is at the heart of creativity, and from early childhood, Cervantes was a master of this essential skill. Q: What do you hope young children will learn from this book? M: I hope they’ll see that the human imagination is more powerful than any monster, including the Spanish Inquisition, which tried to prohibit imaginative literature. Miguel's Brave Knight will be at your local library, indie bookstore, or Barnes & Noble on October 1st! To learn more, check out our New Book News post.